On a wet track, Soheil Ayari had claimed pole poistion for race 2, in the qualifying sesion for the top-seed drivers. He was ahead of Makowiecki (#10 Mirabeau Viper), Dumez (#11 Euroflash Autovitesse Viper), Policand (#3 Larbre Ferrari 550), Alliot (#24 PSI C5-R) and Bouchut (#27SRT C5-R). Bouchut had an off in this qualifying session and the Corvette was withdrawn from the race. Before the start, the drivers were wondering whether to choose slick or rain tyres, the track still being wet after some heavy showers. Most of them started with rain tyres for the formation laps but pitted immediately to change their tyres. 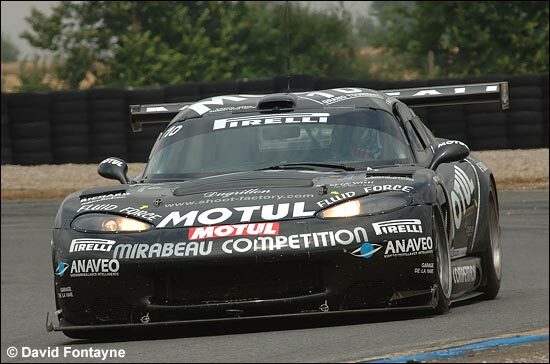 During the formation laps, Alliot had an off and the Corvette C5-R was badly damaged. He made it back to the pits, but the C5-R could not be repaired and was withdrawn: two Corvettes down and the race hadn’t even started. Soheil Ayari made a good start. Cyril Hélias (#5 First Racing Viper) who had started from eighth place, was really flying (on wets) and was second at the end of first lap, ahead of Makowiecki, Dumez, Lasserre (#14 Tarrès Viper), Zangarelli (#12 Mirabeau Viper) and Palttala (#25 PSI C6.R). However, Hélias pitted as soon as the second lap, to switch to slicks, with the track drying so quickly. On the third lap, Dumez in his GTS-R moved ahead of Makowiecki’s Viper. Policand retired the Larbre Ferrari, contact having damaged a wheel and the drivetrain of the 550. So, Ayari was still in the lead, ahead of Dumez, Makowiecki and Zangarelli – all in Vipers. Meanwhile, Lasserre and Palttala made contact and lost some precious time. Later on, Dumez in #11 took advantage of the traffic and the backmarkers to close on Ayari. However, he hit Ayari, the Saleen had a spin and fell down to 11th place. Ayari also collected a slow puncture and had to retire. 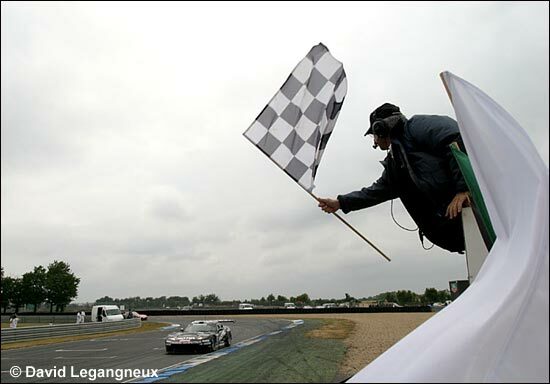 Dumez was now leading the field, Makowiecki was second and Zangarelli had to contain Thévenin (#1 VBM Viper) for third place. 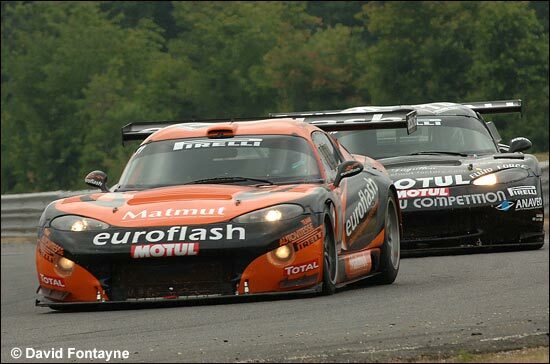 Dupuy, after a strong fight with Giroix (#4 First Racing Viper), was now fifth. Just before the driver changes, Dumez and Makowiecki were neck and neck, ahead of Thévenin, Dupuy and Zangarelli. All of them pitted at the end of the driver change period. 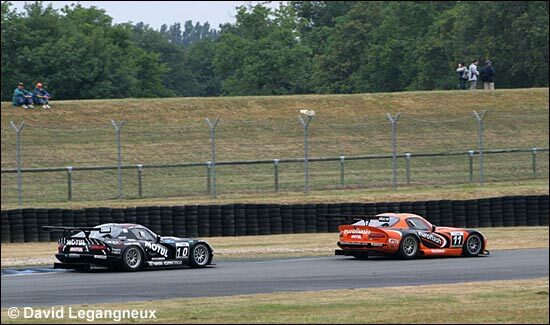 After the driver change, Lesoudier (#10 Viper) passed Dumez's partner, Richard Balandras, in Turn 1. "I don't know the car very well. I started from the pits putting on the speed limiter, but I engaged first gear, while I should have engaged the second one, so I lost much time. It's a shame, because we had the car to win the race," Richard Balandras said later. During the second half of the race, Balandras attacked Lesoudier, but he didn't succeed in passing him. Lesoudier in the black #10 crossed the finish line as a winner, while Bornhauser (#1 VBM Viper), the defending champion, finished third – so a Viper 1-2-3. In the GT2 Trophy, Raymond Narac (IMSA Porsche) chose to start with rain tyres, but it wasn't the right choice, and he had to pit to change them. 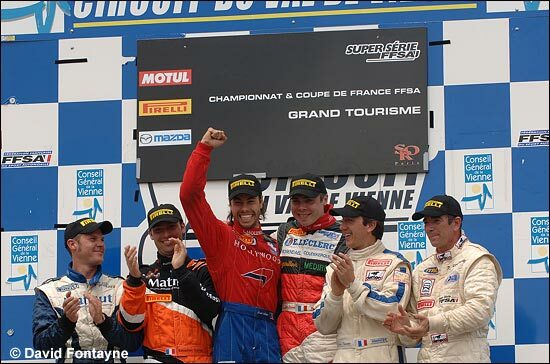 Romain Bera (Dodge Viper GT3) took the lead but eventually the Monteiro brothers (Estoril Porsche 996 RSR) claimed the win, while Narac and Lecourt, after a fine comeback, finished second. Frédéric Makowiecki - 1st : "Because of our heartbreak from yesterday evening, it was important to perform quite well. We really wanted to take our revenge. This win is very important for the team, which has done great work since the start of the season, and I believe that we had the best car throughout the weekend. We had some good fights, it was very nice."